Our Lady of Lourdes Parish confirmation class of 2017, seen with Bishop W. Francis Malooly of Wilmington, Del. Seaford, located in Sussex County, is often called “lower, slower Delaware” by those to the north. Our Lady of Lourdes, part of the Wilmington Diocese, was created in the 1940s as a small Catholic mission in a downtown storefront. By 1948 there were enough Catholic families to build a church. In 1970 our Hispanic population was growing, and the Redemptorists sent us priests known the world over for bringing the word of Christ’s love and mercy to many forgotten people in the tradition of St. Alphonsus Liguori. Since then the Redemptorists have blessed our parish with the apostolic zeal of St. John Neumann. In Seaford we now have two priests from India whom God sent to us from the Liguori Province of Kerala. Parishioners repeatedly comment about our priests’ depth of spirituality and wisdom. Our Lady of Lourdes is now a growing parish serving nearly 900 families. We will celebrate the parish’s 70th anniversary in 2018. Our big news is a capital campaign to build a new rectory. Our priests, a dedicated parish council, and a master planning committee received the blessing of the diocese and initiated a plan and architectural drawings. The campaign is titled Taking Our Past Into the Future—Continuing the Journey. 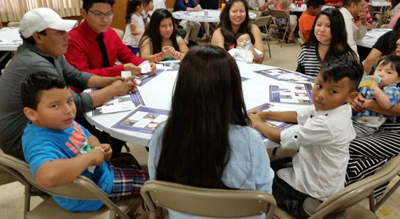 A family participates in a bilingual parish event held June 26. This was a long process of volunteer work by parishioners with legal, architectural, engineering, historical, financial, fundraising, and zoning expertise. It required hosting parish hall gatherings to inform, educate, and solicit ideas from parishioners. In addition to a healthy on-campus home for our priests, the plan includes parish offices, a meeting room, fellowship space, and, if all goes well, counseling and classroom space. The old rectory, built in 1952, has deteriorated and is woefully inadequate, with mold and electrical problems. Father Clement Vadakkedath, observing the state of affairs upon his arrival in Seaford, invested a great deal of time and energy in this project. The diocese has offered fundraising direction for a capital campaign to begin this fall. Father Clement and Father Paul Kuzhimannil Mathew have come to us from a part of the world where Catholic community is ingrained. They have blessedly shared that spirit with us. North Americans, in general, are by nature independent and caught up in their daily lives. A mobile and materialistic culture has robbed us of the sense of community. Our priests are truly a gift from God. Our parish includes an active St. Vincent de Paul Society that feeds and helps the needy. They work with businesses in the area that contribute food, including a southern Delaware poultry company which donates fresh chickens for the Society to package and distribute. St. Vincent’s has relationships with shelters and safe havens for women, designated monies for the indigent, and a discreet call-in and communication network to assist desperate people. Approximately 40 percent of our parishioners are Hispanic. In these uncertain times, the Church is their primary place to celebrate faith and tradition. Our Hispanic community is metaphorically living in limbo. Its members contribute their essential spirit of family and love for the Church but often cannot afford to contribute financially. Our Lady of Lourdes, in some ways, resembles an overseas mission planted in a semi-rural American town. The effort to educate our entire community, including our Hispanics members, is bearing fruit. They are receiving instruction (in Spanish) on marriage preparation, Bible study, and the sacraments. We hope to continue our English as a second language program in the future. The Knights of Columbus are active here and work with boys in the parish to train them in the ways of service and responsibility. I am only touching on the subject of our ministries, but all 25 of them fill a need, from the prayer shawl ministry to our pastoral care ministry. One of the vital missions of the Church is the education of the young. About 200 children are enrolled in CCD classes. In May 47 children received their first Communion and 40 were confirmed. Education for adult Catholics is also important at Our Lady of Lourdes, and there seems to be a yearning for deeper knowledge of our faith. We have a well-schooled couple, Jim and Mary Delclos, who teach Bible classes throughout the year, using materials from Ascension Press. There is so much good going on with our Redemptorist community here. We are a Church and a mission.